Check out the cross reference sheet (found in the documents tab) correct for fit. 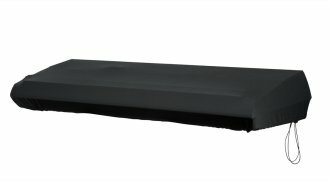 Gator introduces one of two Keyboard Covers, the GKC1540 for 61 and 76 note keyboards. This exciting dust cover is constructed of incredibly stretchy lycra / spandex. An adjustable shock cord is designed to assure a snug, skin-like fit. Stretchy Gator Keyboard covers protect your keyboard from dust-related damage with amazing style. Available until 11 PM (EST) today. Mention special code 1ZZ-C7TR when you call.